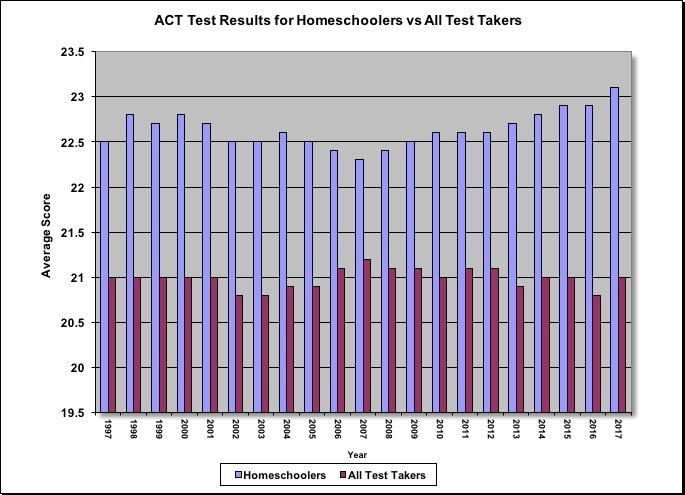 ACT test results are consistently higher for homeschoolers than the composite for the average college entrance test taker. Check out this national data for each year’s graduating class since 1997. I again caution you that the designation that someone is home-schooled is self-reported, and that we have no way of knowing how long they have been home-schooled. There may be many students who home-school until they get to high school, and these would not be included. Similarly, students who list themselves as home-schooled may have been so for only a year, and these would be included. 9,117 homeschoolers average composite score was 22.4. [1,206,455 students took the test in all, averaging 21.1.] [0.76% homeschoolers]. 11,195 students who list themselves as homeschooled took the test, and their average composite score was 22.4. [1,420,000 students took the test in all, averaging 21.1.] [0.78% homeschoolers]. 11,535 students who list themselves as homeschooled took the test, and their average composite score was 22.5. [1,480,469 students took the test in all, averaging 21.1.] [0.78% homeschoolers]. 12,230 students who list themselves as homeschooled took the test, and their average composite score was 22.6. [1,568,835 students took the test in all, averaging 21.0.] [0.78% homeschoolers]. 12,731 students who list themselves as homeschooled took the test, and their average composite score was 22.6. [1,623,112 students took the test in all, averaging 21.1.] [0.78% homeschoolers]. 13,647 students who list themselves as homeschooled took the test, and their average composite score was 22.6. [1,666,017 students took the test in all, averaging 21.1.] [0.82% homeschoolers]. 13,205 students who list themselves as homeschooled took the test, and their average composite score was 22.7. [1,799,243 students took the test in all, averaging 20.9.] [0.73% homeschoolers]. 13,435 students who list themselves as homeschooled took the test, and their average composite score was 22.8. [1,845,787 students took the test in all, averaging 21.0.] [0.73% homeschoolers]. 14,129 students who list themselves as homeschooled took the test, and their average composite score was 22.9. [1,924,436 students took the test in all, averaging 21.0.] [0.73% homeschoolers]. 15,452 students who list themselves as homeschooled took the test, and their average composite score was 23.1. [2,030,338 students took the test in all, averaging 21.0.] [0.76% homeschoolers].